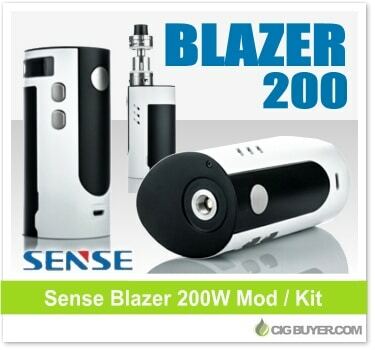 The latest device from Sense Tech, the Sense Blazer 200W Box Mod is an attractive, comprehensive unit that provides up to 200W of output with temperature control (Ni/Ti/SS) and a variety of built-in safety features. Powered by three 18650 batteries, it has an awesome 2-tone design and includes a 3-button interface with side-mounted OLED display, magnetic battery door, USB charging and spring-loaded 510. It’s sold alone or as a complete kit with the Blazer 200 Sub-Ohm Tank, which is compatible with a wide range of high performance Sense coils, including cross compatibility with the Smok TFV8.